A four-point performance over the weekend has the Junior A Aurora Tigers pulling away from the competition in the OJHL’s North division. A familiar name found the scoresheet three times in the Tigers’ 4 – 1 win over the struggling Stouffville Spirit on Thursday night, with Joseph Mizzi notching a natural hat trick before the end of the second period. Jack Varga notched the game’s opener. Jack Irvine was back between the pipes at home at the Aurora Community Centre the following night after blocking 27 shots, showing some signs of fatigue in the Spirit’s 4 – 3 win. Inserted into the game after a slow start from Christian Filippetti, Irvine and the Tigers’ fell behind 3 – 1 midway through the second period on a bank from in close. Jacob Ball pulled the Tigers back within one on a second rebound early in the third period, though Irvine was fooled just minutes later on a long wrist shot that proved to be the game winner. Captain Steven MacLean capped off the scoring in the game’s dying minutes. 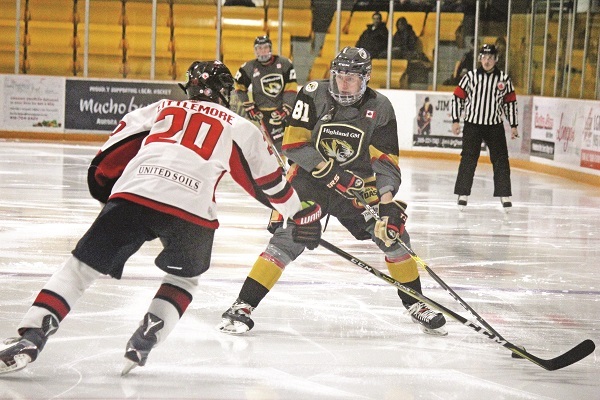 Sunday’s road matchup had the Tigers meeting the new-look Brantford 99ers for the first time, moving to Brantford from their home in Milton as the Icehawks in the offseason. Peppering the Brantford goal with 24 shots in the first period, Aurora took a 3 – 0 lead before the first buzzer thanks to Michael Palandra, MacKenzie Dobson, and a powerplay marker from Mizzi. Brantford stormed back in the second period with three of their own to tie the score, before both Irvine and his Brantford counterpart Tristan Lennox shut the doors in the third to send the game to overtime. Aurora managed to pick up the extra point, with Tyler Davis finding the back of the net less than a minute into the extra frame. A busy weekend and a Markham Royals’ loss to the Pickering Panthers has stretched the Tigers’ lead atop the division to 13 points, holding onto a 17-7-2 record at the midway point of the OJHL season. They sit just six points behind the Oakville Blades for the NorthWest conference, and the league lead. Next up for the Tigers is a visit with the lowly Mississauga Chargers (8-12-1-3) in an inter-conference matchup on Sunday, the only action of the week for Aurora.